Here we have an example of a no win situation. The DHB has been part of Hydra for 3 years, during AT12 he happily accepted his Chameleon prize without any feelings of remorse of dishonour, and furthermore he won roughly 280bn isk betting on the fact that Camel would infact win with evebet, during AT13 he also acquired his AT ship quite happily and netted a modest 360bn on bets of us winning. Any such self loathing or feelings of despair would be believable, however if the DHB was truly as principled as he wants to sound he would not have accepted the chameleon he was given a year ago and the uniques he was given this year for his efforts. Hopefully CCP takes this seriously and investigates to the best of their abilities, but until collaborating reliable witnesses step forward it because a case of he said / he said, and most of the evidence (if any) to be found will be on hidden on servers and forums that CCP does not control. In other words, it will be nearly impossible to prove any malfeasance or collusion unless more people come forward. Perhaps it is time to restructure the Alliance Tournament and stop giving away insanely valuable prizes which seems to only increase the temptation to work against the spirit of event. And if supporting reliable evidence comes forth that the collusion did occur, even within the letter of the law so to speak, I think both Warlords of the Deep and Camel Empire team pilots lose the prizes and get permabanned from future tournaments to send a strong message. I'll be blunt. The Alliance Tournament is a terrible thing. It fails at everything it tries to be, and succeeds only in bringing disrepute upon CCP and the people who take part. In this, it is perhaps a microcosm of Eve. Remove it. Create a new AT, based on 5 vs 5 matches. Allow only T2 modules, give every participant max SP for the matches. Make it depend only upon piloting skill. Mirror matches of set compositions. If this is too boring, allow Theorycrafting. Teams submit compositions into a pot, and are randomly assigned one. The most versatile pilots win. If that is too uninteresting, allow the players to choose which ships to bring. At this point, pilot skill becomes less relevant, and meta/theory crafting more important. Anywhere beyond this and the match may as well be irrelevant. The side that wins wins based on their meta-game skill, not their ingame skill. A competition where one team has all the advantages over the other, even before the match has begun, isn't a competition so much as a mercy killing. And whilst a mercy killing might best describe the treatment of new players by old ones, it doesn't do Eve any good. 1)Some of us found the AT's to be entertaining. 2)The controversies around the AT does not have anything to do with the specific format as far as I can tell. 3)If by meta-game skill you mean training and bringing different compositions, then that is hard work and I am ok with it. Collusion, less so, but see (2). Bringing limited edition ships from previous AT's won (i.e. not commonly available, to every entrant), somewhat problematic yes. 4)I'm 50/50 on skill points. If you bring your own comp you can work around this - fixed comp like you suggest then all V would be better. 5)Smaller groups (5 vs 5) would be less interesting for some, might be more so for others. I do think more players allows for more variation and scope to showcase more of EVE's possibilities. Ever diminishing returns though? 6)Not sure about what exactly you mean by your last sentence "And whilst a mercy killing might best describe the treatment of new players by old ones, it doesn't do Eve any good". Is this in the context of AT (weaker teams should be killed by stronger ones) or EVE in general? Jesus Rob... really? I get that you may not enjoy the AT but you can't speak for all of us. And player drama is what? new? news? even interesting? nope... player drama in EVE is like space... no matter where you look there's more of it. I mean... look at your comment... more player drama... "The Alliance Tournament is a terrible thing. It fails at everything it tries to be, and succeeds only in bringing disrepute upon CCP and the people who take part." Seriously?? No, it isn't no, it doesn't, and no it really doesn't. I disagree with you in the strongest terms. What? You want the playerbase of an online MMO to be what... more honest and less dramalama than RW politicians? RW movie stars? RW athletes? Maybe I was a little overstating it.... I definitely was. I think my problems come from my interpretation of what the AT is meant to be. Is it a contest of piloting skill? I think so. Is it a contest of alliances? Yes. Is it a contest of meta-gaming? Above everything else. I'm naive. I think that the AT should be about who has the best pilots. Everything else that gets in the way of that just irritates me. There shouldn't be problems with funding, abilities to even sit in a ship, or abilities to own a ship. You wouldn't match up a team of disabled people with a team of professional athletes in a competitive tournament. All my suggestions were based on the idea of making the AT based more upon Piloting that Theorycrafting. Worlds Collide, and the player follow-ups, were far more dependent on piloting skill than the AT was. I do enjoy the AT as it is currently, but not with the top teams. Their meta-advantage is so high that few of the other teams have even a small chance of beating them. (I was going to say this in the original post, but I deleted it). The less skilled teams were more fun, because I actually enjoyed seeing mistakes that were overcome. My 'bringing disrepute on CCP and those who take part' point was kinda esoteric, but I'm taking the long view. Valkyrie is far more likely to become an E-sport than Eve ever will be. Valkyrie is also based on Eve. 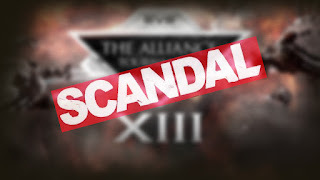 Every scandal in the AT will diminish the chances of Valkyrie becoming an e-sport. So yeah, I think the AT is a failure based on my criteria, but I'm not saying that it isn't enjoyable.